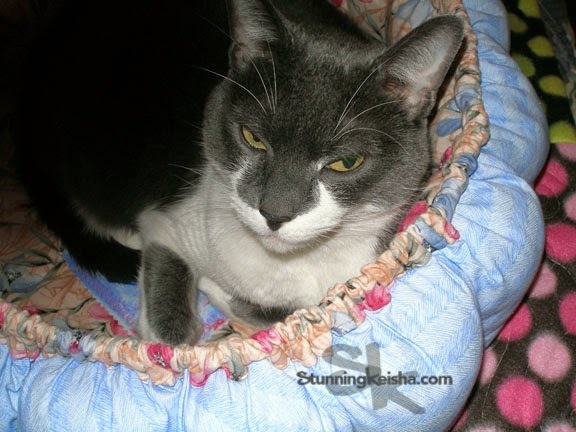 Here I am—all safe and warm in my bed which is on another bed in a heated condo. Not all cats are this lucky. I filed this report for Cat Witness News. Sometimes I write blog posts in advance and then I have to report Breaking News on Facebook. Those on FB know last week we were worried about the Maple Cats. We’d had a big ice storm on Monday and TW didn't leave the condo until Wednesday. When she passed their house, the kitties were both sitting on top of their igloo on the porch. TW promised that she’d feed them on her way home. When she returned, she had to do a double-take. The igloo and feeding station was no longer on the porch and the cats were nowhere in sight. There was a big bag of ice melt where the igloo used to be. The gate to the back yard was ajar but there were no cats. A few days passed and still no sign of the cats, which TW called Mama and Junior. She would have thought that even if their igloo was in the back, they’d still hang on the front porch, waiting to those soft touches who feed them to walk past. But no cats were no be found. "The shelter I built was initially placed in back of the home on a cement slab up against their fence right next to the home foundation. It was later moved to the front porch. Both cats are still around and I suspect that the shelter is, again, at the back of the house. I also know that Ramona [the one we called Junior] has gone into the home when it gets cold, so they have an open invitation to do so. D, the mother, mentioned she's found Ramona on her bed when she awoke but that Ramona would then jump down. Betsy [Mama] is considerably more feral and although I've recently also seen her, I have no reports of any 'in house' activity related to her. The H.'s are nice people. H, the son, is their care giver." This month we’ve had a couple of ice storms, snow and the coldest temperatures in years. The wind chills this week have been as low as -15 degrees. You can see why we were concerned about them. TW hasn’t seen the Park Cats either and hopes they’re safe somewhere. Perhaps they can go into one of the park buildings. That’s this week’s kitty report from Cat Witness News—CK reporting. So there you have it—good news on the feral front. Bad news for me cos I might have to eat the Tunatopia if we can’t feed it to them. We’re happy to know the Maple Cats are safe and one has even ventured into the house. Last winter another neighbor tried to get them to go into his basement when we had excessive cold and snow but they wouldn’t go inside. Here’s hoping the ferals where you live are warm and well fed too. Glad to hear dey are ok. I was so relieved when I saw your Facebook post, CK! 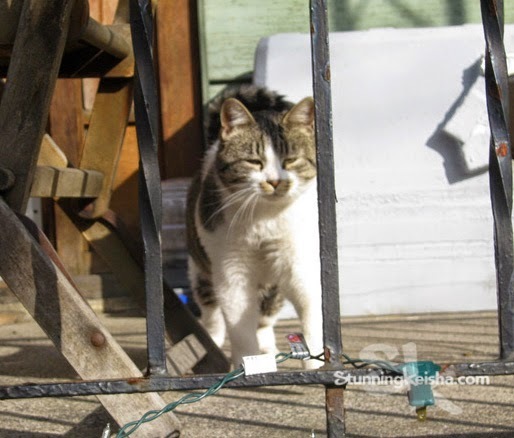 I worry lots about the ferals when the weather is as brutal as it has been in your area. We're glad those kitties are all doing okay! Nice to know they are OK CK. Have a wonderful Wednesday. It's such a relief to know that the kitties are OK. Please keep us posted if the park kitties show back up after things thaw out, too. We'll be crossing our paws for them in this terrible weather. Thank cod the kitties are okay! Oh I would have been worried too! Thank dog! Scary times for all ferals and the worry that we parents have for them is intense. Thank goodness they are safe. The thoughts of animals having to be out in this brutal weather just kills me. Glad the kitties are OK. It's such a scary time for feral and stray kitties. TW is wonderful to look after them! That is SUCH good news about the Maple Kitties. Maybe not so good news about the Tunatopia but hey, you can't win 'em all....! We are sure glad those sweeties are safe! We are so glad everything worked out...whew!! glad they are safe and sound!! I'm glad to hear that the Maple Kitties are doing okay. It has been crazy cold this year. I feel bad for any kitties that have to be outside in these temperatures. I am glad those kitties are safe. I hope the park kitties are safe too. Glad they are still OK CK! I am pretty sure there is a white fluffy feral around these parts. I've seen a glimpse of a flash of white fur about 3 times now in the past few months. He/she's a very elusive cat! Also, unrelated but I just have to tell you that my oldest daughter keeps calling Callie "Cathy" mol... she is mixing up her name and I think she must have got picked it from you! Whew! So happy to hear they are okay. I did see your post on FB. Tw is such aid human to watch out for those kitties and the other hers she has helped thru the years. You're goodhearted, CK!! Boy that is cold!! Here's hoping there's no outages in your neck of the woods!! So glad they are safe! 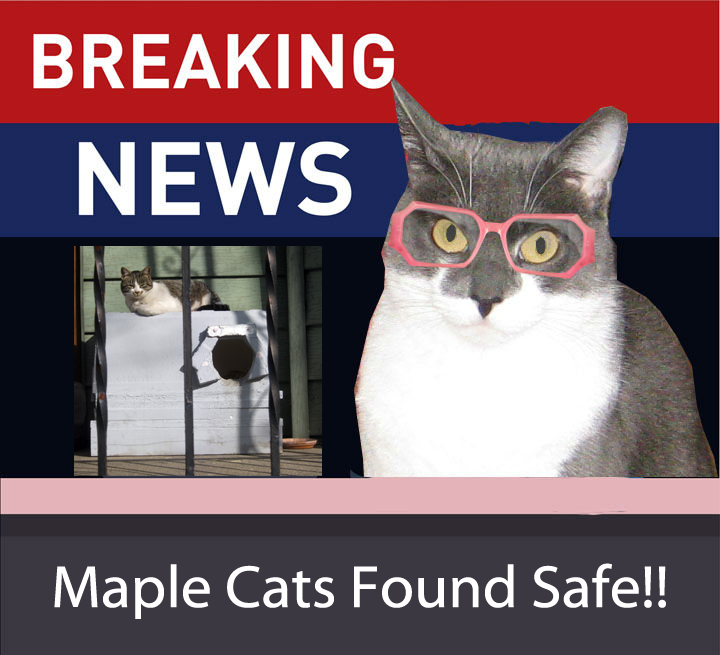 We're so glad the Maple Cats are okay. And we saw on FB that TW saw one of the Park Cats. That's super! That those kitties are safe. I pray every night for all the poor ferals and strays out in the cold.